I am honored to be included in this collection of essays. Available at Amazon or directly from the publisher. DONNER ‑- If your idea of a dream ski vacation includes an apres-ski lounge where you put your feet up in front of a 72-inch HD football game while cocktail waitresses in bunny suits refill your hot toddy, then Clair Tappaan Lodge is not for you. I recently visited the monstrous lodge, a living history of the club’s change from an outdoor appreciation and exploration club to a political lobbying group. It sleeps 137 member and nonmember guests alike. Shared bath, bunks and meals sounded to me like a good way to save money while creating a foo-foo free weekend experience for the kids. The $47 per night adult fare includes 3 meals. Guests bring linens and do one chore per day. I wouldn’t say it’s a bargain, but the history lesson and eclectic mix of fellow guests are priceless. My husband had been hoping we could all join him on an overnight ski trip into one of the club’s exclusive huts located in the Tahoe National Forest, but unfortunately our boys, both under 13, were too young and wouldn’t be allowed to go. This meant I would get the kids and my husband would get to join a group of 14 other snowshoers and cross-country skiiers to trek into the Peter Grubb hut, located three miles into the wilderness from a trailhead next to I-80. Arrangements for a list of area programs from children’s cross-country skiing to “Rails and Trails,” a popular local history tour, are made through Clair Tappaan staff. An avid downhiller, I chose to see the positive side; this would be an opportunity to give the boys some quality Mom-time and Dad wouldn’t see the lift ticket receipts. We pulled up to the lodge just west of Donner Pass Friday night at 6:15. We were late for dinner. It was a steep hike to the front door…through rained-on snow. The elevation of 7000 feet was 6000 higher than my oxygen level. We all grabbed gear and started up. The front door was welcoming; a key had been left in it. Inside a hand-lettered sign implored me to lock the door behind me. The left-in key suggested humans were not the target thieves. Other ground-level doors (some on the second floor for when snow is really deep) had barn style locks meant to keep out bears, one of whom had actually made it into the main hallway of the lodge just last week, I would learn from staff later on. A steep set of stairs led us to another door, from which we emerged to the fantastic smells of Mexican food being self-served family style to 30 or so guests seated on benches in a school-cafeteria style arrangement. We were immediately greeted warmly by a rosy-cheeked youth straight out of Hansel and Gretel, who turned out to be the lodge manager. Other guests made room at a table with no solicitation and we were soon gulping soul-warming corn chowder with just enough picante for my nine-year-old to be able to slurp it up. That evening my husband built a fire and listened to a retired astronomist recant his effort during a recent “work party” to unearth the floor of the wood room from its 18 inches of wood chips. The living room of Clair Tappaan Lodge is very spacious, both vertically and horizontally. Entirely wooden, the interior walls answer the question of what to do with those ancient skis in the rafters of your garage. Tack them to the walls with hemp ropes to create a 70-year-old ski lodge look. This room was the original lodge, built by volunteers in 1934. My seven-year old appeared briefly between ping-pong sets, and studiously hammered out “Jingle Bells” on the piano. A group playing cards across the room began to sing along ‑ to my son’s enormous pleasure. A white-haired, dapper, Steve Devoto, who was to lead the ski trip tomorrow arrived well past dinnertime. He settled into one of the pillowed wooden settees and began telling me about visits to this place he had been enjoying since 1955. Then another man of the same description, somewhat younger, entered the room. “Yeah, I am,” Roger confirmed, with a look of wonder. “I brought it to three paddling classes but I haven’t seen you,” Steve said. Roger thought back and concluded that Steve had been carrying it for a year, only to learn that Steve had left it in the car. “I wasn’t going to bring that thing up here,” Steve said, referring to the hike to the lodge’s front door. “It must weigh a gram,” Roger retorted. Steve laughed then Roger launched into black strap memories. “That thing saved Jean,” he began, recalling a snowshoe trip in blizzard conditions, during which an elderly man had life-threatening snow shoe issues. A German-accented woman entered and Roger was eager to make her the trip leader instead of Devoto, owing to her accent, if nothing else. After a basement check on the pony-tailed twenty-something guy who seemed entertained by improving my boys’ ping-pong skills (I never did learn his name,) I perused the library. A table bore a flawlessly assembled puzzle, the kind I figured kept someone busy for at least two full days. Several decades of National Geographic Magazines yellowed the shelves amongst log books that document visitors’ adventures in the area . . . almost a century-worth. Wilderness reference books, novels, and adventure books crammed the many other shelves. A magazine rack gave clues to the interests of the discriminating visitors to this place. Sierra Magazine, of course, but also AARP’s mag, On Earth, Alaska, Mother Jones, Utne, Astronomy, Americas and the New Yorker. I easily spent two hours reading these as well as logbooks from mountain peaks along the Sierras, some dating to the 1930’s. Then I checked on the ping-pong lesson again, still going strong. I asked a few questions of the ponytailed guy so patient with my boys. He is an electronic engineer in Silicon Valley up for the weekend by himself. Is there a better role model for my kids? I don’t think so. Deciding the boys are safe with the geeky guy, I head for our room. In contrast to recently remodeled community bathrooms, our beds reminded me of my own college low-budget tour of Europe. Five bunks creatively installed in our narrow room offered mattresses atop patched springs obsolesced by recycled plywood. Pillows with “you put ’em on” pillowcases atop were the only other offerings. A warped board-slash-shelf along the opposite wall could almost be reached without getting out of bed. Single brass hooks, a two-foot hanger dowel, a twisted hanger and a dusty mirror completed our accommodations. A back door provided the fire escape I was instinctively looking for. In the morning I would find the door led to a back porch overlooking a sledding dreamscape: A gentle slope of mature forest with no underbrush, encircling an open meadow. This lodge, the location of the first mechanized ski lift ‑ a rope tow to the top of Signal Peak continues to catalogue history. Among guests I met over the weekend were an “information activist” from Berkeley (still not quite sure what this means) as well as a retired photographer who described what it was like to work with Ansel Adams in his lab. And my husband’s ski adventure? “Lots of people on the trail,” he reported, including a team of search and rescue snow mobilers on a training exercise. Post-trip email chatter included mention of snowshoe hare tracks, brilliant stars and kudos to a brave tenter. …and that’s about it. Clearly the wildlife adventure experienced inside the lodge exceeded my husband’s outside it. Kyoko Mori is at ease in her living room explaining to a small class of MFA students how Miles came to be the love of her life. “Miles is complicated,” she says. Miles, meanwhile, has retreated to a back bedroom for the evening. “He is just like me,” Mori concludes. Miles, named after Miles Davis, is a Siamese cat of perfect proportions, blue eyes and sleek adobe-colored fur. In contrast, Mori’s other love, Jackson (named after Jackson Brown) is jet black and does not contemplate the meaning of things. “He is more like a Midwestern guy,” Mori says. Cats are clearly Mori’s favorite subject and she talks about them as a devoted parent would her children. “Everything is about them and for them,” she confesses. So it is no surprise her latest book, titled Barn Cat, involves a supporting character named Horatio, a farm kitten. This book, on its surface, is not complicated. It mostly takes place in the Midwest. Part of Gemma Media’s Open Door series, the 86-page pocket-sized book (40 standard 250-word pages), with eleven brief chapters, is for new readers. This audience may be American adults learning to read or it might be immigrants learning English. The book is not dumbed-down in any way, but tells its story in simple, loaded sentences. “I decided I was going to write them for clarity,” Mori says, explaining that if she wrote the sentences longer, the editors would just cut them in half, breaking apart clauses. “I like the spare, crisp style anyway,” Mori says. Mori grew up in Japan and first came to the United States as an exchange student at the age of 16. Then, as an undergraduate college student she transferred to an American university and never returned to live in her native country. 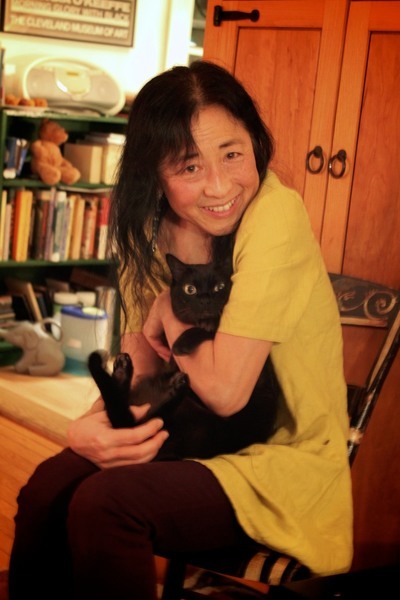 Barn Cat’s first person narrator moves from Japan to the United States at the age of eight. Having studied English in Japan and later, French in the United States, Mori is an authority on language learning. She recalls the boring material used to teach her French as she describes the goal for the Open Door series of which her new book is a part. If she had something interesting to read in French, the language would have been much easier to learn, she says. When the publisher of a prior book, Yarn, asked Mori to do an Open Door book, Mori recalls, “I thought, this is great … this is what I want to do.” Mori says the specific style of writing for the new-reader audience is as much work as writing for a more general audience. But she said writing 40 pages as opposed to 400 is the difference between painting her high-ceilinged living room in a very intricate way and painting the whole three-story apartment building. Mori says she would not have the stamina for an entire novel. All of this contributed to Mori’s consciousness in the book, the author says. As all great literature offers readers a vicarious experience, Mori’s book adds a dimension; it allows its writer one as well. 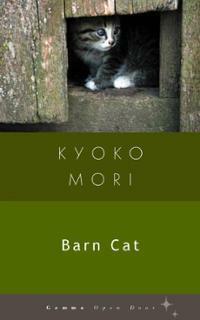 “I have never adopted a barn cat,’ Mori says. Barn Cat enables her to assuage her guilt without crowding out Miles and Jackson. Professor Kyoko Mori teaches creative writing in the English department’s MFA program. Her other works include Shizuko’s Daughter, Yarn, Polite Lies, The Dream of Water, Stone Field, True Arrow and One Bird. She also teaches for the low-residency MFA Program at Lesley University. Barn Cat can be purchased through its publisher, Gemma Media. Charlie Barra. Who else would come right out and say that? That’s right, a man who owns his own winery would say that. A man who makes his own endposts and catches his own water in his own reservoirs. He even built his own gondolas. Barra, who celebrates his 84th birthday this December as he celebrates his 65th year growing wine grapes, (65th year growing organic wine grapes,) is a serious man. With a serious mischievousness to his chin-splitting grin. But Barra is a lifetime leader of the new world of grape-growing, the fastest growing market sector, organics. And his family’s old world wisdom has taken him to that rosy future. Barra does not buy grapes but he does sell some. He also reports that he sells some bulk juice. His Redwood Valley Cellars are known throughout California as the go-to certified organic north coast crush facility. So is he organic by heart and soul or by pocket book? Barra said he grew up growing grapes in California in a family closely tied to the land and farming. By the age of ten he said he could prune as well as anyone. He said a characteristic birthday gift for a boy that age would be a good pair of pruning shears. That was also before the advent of chemical pesticides. Charlie Barra strolls his Mendocino County vineyard. His family, Barra explained, had the ‘resource of experience’ to produce wine grapes without sacrificing the environment. It is with this independent spirit that he challenges his fellow grape growers to say no to toxic pesticide use. Barra is kind enough to add that this is not a personal attack. “That’s their job to sell chemicals,” he said. “But it’s not my job to buy them.” Big Grin. Barra said he started farming when he was still in high school. Recalling the day he announced to the principal that he was quitting in order to run a neighbor’s farm, he also recalled the derisive laughter his announcement met. But he met the insult with determination, noting that he would go on to make three times the principal’s salary in his first year. That financial achievement may have guided Barra the rest of his life, but so would another element of the allegory. The day after he quit, the principal dragged the vice principal into the discussion, according to Barra, a man who was a friend of the teenage Barra. A deal was reached that would have Barra attending school half days, free to farm the remaining daylight hours. Another Big Grin. His 200+ acre Redwood Valley Vineyards and Winery produce 25,000 cases of a list of varietal wines under four labels. Barra’s financial success aside, his name comes up in credits of the North Coast Grape Growers Association, the transition from what Barra calls ‘vin ordinaire’ planting to varietal planting of the region in the mid-twentieth century as well as a number of growing practices. Barra said he doesn’t spray or dust his vineyard; he merely does a single application of copper and sulfur at two-inches shoot growth. Through the sprinkler system. Biggest Grin. And he claims his opinions are ‘probably unique’ also. For example, modern economic problems—as well as global hunger issues—would dissolve according to Barra if the U.S. government would require all imports to come from countries that had minimum wage laws in place comparable to those of this country. “The government is asleep,” Barra opines gently. The lively Barra is also ready to share observations about the economics of local agriculture. As a lifelong organic grower—one who has grown organically before organic was ‘cool’ or before the term became legally binding, Barra is perhaps uniquely qualified to comment. In his view, “sustainability” is merely a term used to sidestep the organic rules. Barra was appointed to the Mendocino Board of Supervisors as a democrat by Governor Ronald Reagan. Then he said he made a deal with Reagan that if Reagan would run for president, Barra would switch parties. Big grin. A tour of the Barra vineyard operation yields many stories, enough for a book. A book at least one of his children would like to see written. Shelley Maly is the sales and marketing branch of the Barra family tree and cherishes the story she has watched happen. All three children are involved in varying degrees in the Barra operation. And Barra’s wife, Martha? “I’m the owner, she’s the boss,” Barra grins again. Ouch. Barra inspects vines in his Mendocino County vineyard. LAKEPORT – “We aren’t trimming fat, we’re cutting meat,” Lakeport’s school chief said of the $561,800 in budget cuts she proposed at a Tuesday night special meeting of the school board. Lakeport Unified School District superintendent Erin Hagberg told the audience of almost 20 that the cuts would have a “crippling effect” on funding and services to students during the 2010-11 school year. If approved, students will get a longer Thanksgiving vacation, elementary level teachers will have more students and more children will be walking to school. Using an overhead projector to show revenue losses totaling $528,850, Hagberg explained that the combination of $300,000 in state budget cuts and $198,000 attributed to declining enrollment was largely responsible for the reductions. A negative cost of living adjustment for employees accounted for the remaining $30,000 shortfall from this year to next. If the cuts are approved at the regularly scheduled board meeting Thursday evening, four teachers, one principal, and an assistant day care position will be gone this fall. “It will have an impact, obviously, on kids,” Hagberg said. Under the proposal a bus route also will be eliminated, Hagberg said. Which route will be cut is to be determined according to safety assessments, not distance to school. Perhaps the only popular cut would be to the school calendar, cutting the two days of the year with perhaps the poorest attendance so students wouldn’t go to school at all the week of Thanksgiving. Other cuts would include eliminating the K-8 grade summer school program, which “directly affects kids,” in Hagberg’s words, and loss of the high school readiness program. Hagberg commented that the cuts proposed Tuesday would bring Lakeport district’s total for the past three years to $1.6 million in budget reductions. The 2010-11 district-wide budget will be $14 million after Thursday’s expected cuts. Three of the teaching positions proposed for the chopping block will occur at Terrace School, which serves fourth through eighth grades. The other would be at the elementary school, where class sizes would grow to 24 students per teacher. Teacher to student ratios are worse at the district’s other campuses. The principal position being eliminated would be that of the alternative education principal who currently administers the district’s home school program, the community day school and the alternative high school. “It will certainly have an impact on children,” Hagberg said. Explaining her budget choices, Hagberg thanked administrators at all campuses for their thoughtful input. Board members responded to Hagberg’s proposals with few questions. Trustee Dennis Darling expressed appreciation for the work that went into the recommendations. “It’s been hard on staff,” he said. Board president Tom Powers, who said he “looks forward to when this trend reverses,” referred to the personal affect the cuts will have on his family. “I have two children in this district and I know these cuts will affect them,” he said. As Stillhouse Press wraps up chapter one, it’s opening chapter two. Bill Miller, director of the creative writing program, says the new Mason-run press is actively seeking manuscripts for its second publication. “We are open for business,” says Miller, who is also executive director of Fall for the Book, the annual Mason-based literary festival. Stillhouse Press, founded last year with the help of alumnus Dallas Hudgens, MFA ’92, is a collaborative, student-run publisher of fiction, nonfiction and poetry. Hudgens’ own press, Relegation Books, donated startup funds for the Stillhouse venture that formed from a collaboration between the Mason Creative Writing Program and the nonprofit Fall for the Book. Martinez, a third-year MFA fiction candidate and one of a trio of Mason MFA students who runs the new publishing house, says Stillhouse is independent from Relegation and differs from other publishing houses as well. Writers interact with Stillhouse editorial staff, remaining involved in the process of crafting the book at every step from sentence level work such as verb tense to marketing material production. As with the eponymous moonshiners working with the mash as it is distilled, the objective is a better product. Stillhouse’s first publication, Helen on 86th Street, a story collection by Wendi Kaufman (MFA ’97) gave students experience they couldn’t have predicted. Paperback pre-sales particularly surprised Meghan McNamara, media director for Stillhouse, and a third-year MFA fiction candidate. Stillhouse staff used social media to round up student volunteers to process the large number of orders. To thank them, Stillhouse ordered a round of drinks at a pre-party for volunteers at the March 1 Loudfire reading at Epicuré Café in Fairfax. The third member of the trio, third-year MFA nonfiction candidate Merrill Sunderland, handles operations, the physical distribution of the books. Martinez comments that next time he’d like more time between galleys and publication, time to allow reviewers to produce commentary. In the case of the debut, with the author very ill from the effects of cancer and its treatments, the rush to print narrowed that gap to the detriment of the book’s best promotion schedule. Despite the rush, Martinez regrets the book did not return from the printer in time for author Wendi Kaufman to hold a copy in her hands before she succumbed to her illness. But she knew her words would go forth in the world, Martinez says, and her legacy is preserved. “It’s really bittersweet,” he says. Moving on, the team of faculty and students is actively reviewing new manuscripts. “We’ve received some fiction … also a nonfiction first person non-political memoir,” says Miller. “We’ve set up a reading process,” he says, involving undergraduate students led by Martinez. “We are currently reading manuscripts in all three genres (non-fiction, fiction, poetry) as we search for our next titles,” Martinez says. “Our goal is to publish one prose book by the end of 2015, and one poetry title followed by another prose book in 2016, and then publish three-plus books per year from 2017 onward.” In other words, he says, two more books in the next 12 months. Martinez says Stillhouse is particularly interested in literary fiction with a voice and narrative nonfiction. Novels, Martinez specifies, or collections of stories that have a greater cohesion than just a collection of unrelated essays, from good established and emerging writers. He is also looking for work that has solid social and cultural context. Although a specific nonfiction manuscript is currently being considered, none of the Stillhouse staff is ready to say anything about it, implying only that it is a work-in-progress. Jay Patel, MFA ’11, contributed to this article.